This week, OHSOGRAY joined Angelica Celaya for lunch in Beverly Hills to chat about her role as Zed on NBC’s new show Constantine. Celaya was delightfully friendly and candid about her childhood, move into acting, and the challenges of playing a super natural character. Here is part 1 of the interview. Constantine airs Fridays at 10pm on NBC. Did they make you learn Latin? Angelica Celaya: No! Thank god that’s Matt! Matt right now is doing all the different languages every single episode, which is hilarious because I will talk to him in Spanish and….he knows all these languages but Spanish he doesn’t know. There’s a really good episode where it might have been the case where me and Chas and Manny would maybe had to learn some other language to help. It didn’t come to that. Since Zed has visions, does she also speak in tongues? Let’s talk about the romantic tension. What can we look forward to with that? 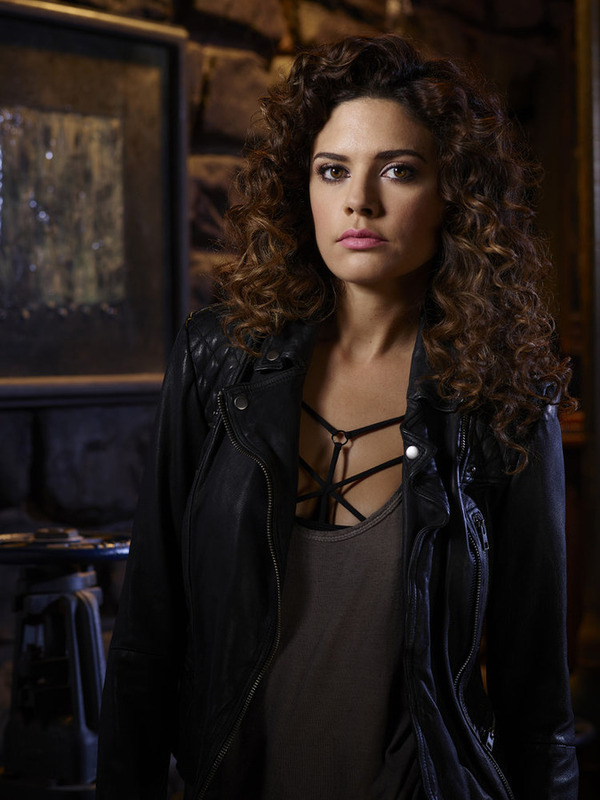 Angelica Celaya: There’s definitely lots of tension. It’s funny cause sometimes it might be just a little too much. [Laughs] It gets really interesting because there are some things I don’t like because he’s not only a dabbler of the dark arts, but he’s also a dabbler in women. So maybe Zed doesn’t like that. That he dabbles here and there. There’s an interesting situation that’s going to come up in the Specter edition of the show. Zed is going to get some major lip action going on. I can’t say [with whom]. But, yeah, she’s going to get some action. Angelica Celaya: Something very very interesting that’s going to tease … a big tease is coming. I can’t say much, but there’s definitely something there. There’s a lot of protection and learning, and Zed feels like she needs to be by John to consistently to keep learning. But she gets a little jealous with that attention so she always wants to be there. So in case he wants to leave her behind…she doesn’t like it. She always wants to be there. Have you been consulting the comic books for your role? They gave me a couple Hellblazer comics to learn about Zed and her sarcasm – the way she is and she’s this rough chick. She doesn’t care. Of course, we learn that Zed is Mary in the Resurrection Crusade. She’s a weirdo. She’s a survivor. Zed’s past and future are messed up. Have they given you any indication how far they’re going to take that in following the comics? Angelica Celaya: Oh yeah. They’re going there. Little by little. I think if they go full force right from the beginning…it’s too much. I think it’s always good to tease with it and play with it, a little by little because her drama is too big. Her family is too insane. What she’s going through is too much. I mean, come on…giving birth to the second coming of Christ – that’s not an easy thing to do! As of episode 11, we do touch on it and it does get dealt with. There’s really tough situations where you learn why Zed has these walls and why she’s apprehensive and why she’d rather deal with demons than her family. I just got word that the future episodes before the season finishes – it’s definitely going to touch on that hero aspect of Zed, making decisions on her particular situation. It’s going to get intense. Do you see Zed as a hero? Angelica Celaya: No. She’s not a hero. Not to herself. She’s surviving. She wants to help. She wants to survive and she believes everyone else should have the same opportunity to survive. She believes the opportunity to survive, the opportunity to change their own destiny. She doesn’t want her destiny – she doesn’t want the destiny she grew up listening to from her dad. She doesn’t want the whole weight of that situation on her shoulders. She believes that she can pick and choose what she wants to do. Maybe there’s a higher purpose. Within all that, she questions God a lot and whether it’s a curse or a blessing. When you think of yourself as a hero, I don’t think you question God. Zed does question God.